Arum: Hearn Doesn't Know D*ck About Promoting In The U.S.
Just because Bob Arum is doing business with Eddie Hearn this week and is in discussion for a collaboration in the future, it doesn’t mean he’ll pass on the opportunity to take a shot at his promotional rival. 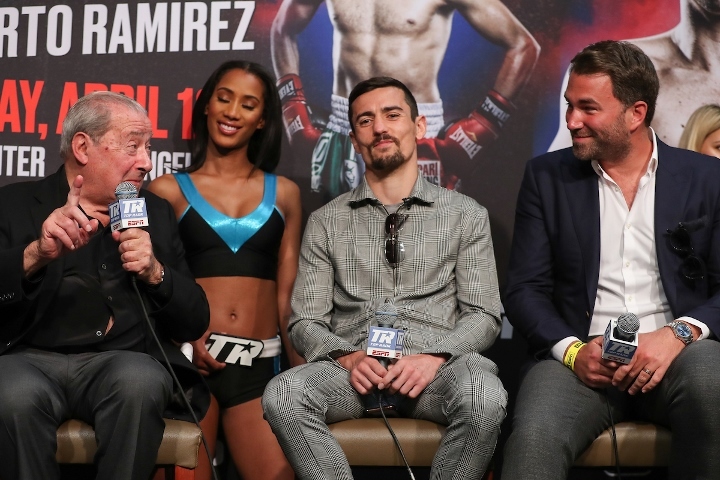 The pair of veteran promoters join forces for Friday’s ESPN+ card in Los Angeles, topped by unified lightweight titlist Vasiliy Lomachenko’s mandatory defense versus England’s Anthony Crolla. Lomachenko is promoted by Arum, while Crollas has long fought under Hearn’s Matchroom Boxing banner in England. Top Rank admittedly overpaid for the fight to avoid the risk of letting it go to a purse bid hearing. Hearn was prepared to go that route in order to bring the fight to England and have it stream live on DAZN, for whom United Kingdom’s leading promoter is the primary boxing content provider. Arum instead raised the ante in order to keep the fight on his side of the street—and in the U.S., with the headliner at Los Angeles’ Staples Center aligning with the one-year anniversary of ESPN+, the live streaming platform of ESPN. That said, the Hall of Fame promoter has fond memories of any time he’s had to fly across the Atlantic Ocean, even recalling a trip to Crolla’s hometown of Manchester, England for a press conference to promote a big Pay-Per-View event in Las Vegas. None have done it as well in recent years as Hearn, who has long surpassed Arum’s business partner Frank Warren as England’s leading promoter. He’s since ventured into the U.S. market, launching Matchroom Boxing USA in 2017 and promoting shows on HBO—prior to their exiting the boxing game in 2018—and exclusively on DAZN since last September. The results have been mixed, with Hearn openly acknowledging the growing pains endured as his team continues to adjust to a new market. When given the chance to pay him a compliment, Arum instead seized the moment to take a playful—if not genuine—swipe at his promotional adversary. The quip was taken in jest by all, even the intended target. “Listen, I can help you sell some tickets for Friday,” Hearn fired back. Crolla (34-6-3, 13KOs) fights in the U.S. for just the second time in his career. The lone other occasion came in Sept. ’11, four years before he would go on to win a portion of the lightweight title following a 5th round stoppage of Darleys Perez in their Nov. ’15 rematch. Just one successful defense came of his reign before conceding the strap to Jorge Linares in Sept. ’16, as well as coming up well short in their rematch six months later. Lomachenko (12-1, 9KOs)—a two-time Olympic Gold medalist for his native Ukraine–ended Linares’ 20-month reign with an off-the-canvas 10th round stoppage win last May to become a three-division titlist in the pro ranks. His first successful defense doubled as a title unification win, decisioning Jose Pedraza in their two-belt clash last December.